NETWORK FINALS: ABC’s NBA game adjusted up 0.3 to 0.7, and FOX’s BIG EAST game adjusted down 0.2 to 0.2. In addition, ONE NIGHT FOR ONE DROP, RANSOM and the SNL rerun all lost 0.1 in final numbers. CABLE HIGHLIGHTS: It was ESPN’s day on Saturday cable, with all of the day’s Top 9 telecasts, led by the ACC TOURNAMENT FINALS (ratings magnet Duke vs. Florida State) at 1.21, and other games at 0.84/0.70/0.69/0.39. In addition, the network had a middle-of-the-night FORMULA 1 race at 0.30. Adult Swim’s line-up performed as follows: DRAGON BALL at 0.30 and 0.09/284K & 0.10/306K compared to last week’s 0.38 and 0.15/447 & 0.15/423K, BORUTO down 0.05 to 0.21, MY HERO ACADEMIA down 0.06 to 0.20/486K, SWORD ART ONLINE down 0.03 to 0.18, MEGALOBOX down 0.03 to 0.17/337K, JOJO’S BIZARRE ADVENTURE down 0.03 to 0.16, BLACK CLOVER steady at 0.17/327K, HUNTER X HUNTER down 0.01 to 0.13/269K, NARUTO steady at 0.14/276K, and ATTACK ON TITAN down 0.02 to 0.10/212K. 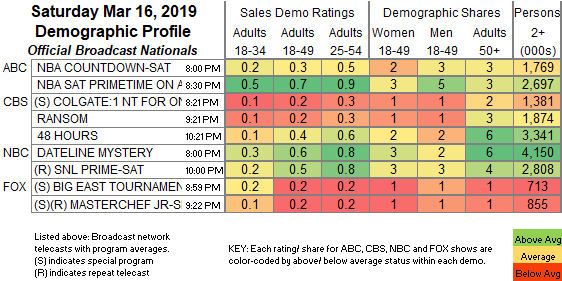 Nickelodeon’s HENRY DANGER was at 0.28. Hallmark’s original movie FLIP THAT ROMANCE was at 0.27. 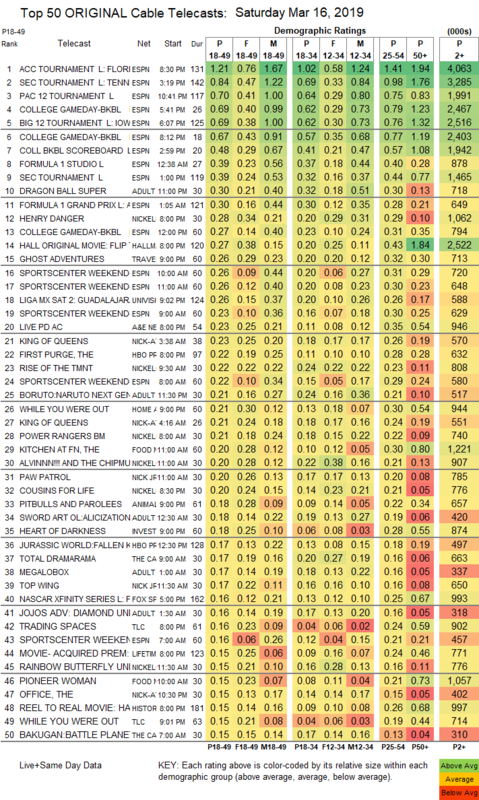 Travel Channel’s GHOST ADVENTURES gained 0.04 to 0.26. Univision’s LIGA match was at 0.26. On Food Network, KITCHEN AT FN dropped 0.07 to 0.20, and PIONEER WOMAN was down 0.15 to 0.14. On ID, HEART OF DARKNESS was steady at 0.18. On TLC, TRADING SPACES was at 0.16, and WHILE YOU WERE OUT was at 0.15. Lifetime’s original movie MOMMY GROUP MURDER was at 0.15. On OWN, FAMILY OR FIANCE was at 0.14, and IYANLA, FIX MY LIFE was down 0.09 to 0.14.